There are different types of brush pen tips and I’m here to show you how to best use them. There’s so much talk about the right hold and angle while brush lettering. We covered how to hold the brush pen in an older post. But there are also different type of brush pen tips. Bristle tips are like regular round paint brushes, and because of the flexible bristle hairs you can hold them a little differently than you’re average brush pen. The felt tip is sturdy and flexible but can only bend one way once the pressure is applied on it. The bristle tip brush pen has timy bristle hairs – like a traditional brush – and once you apply pressure they can bend as you like and the bristles can point in any direction while you move the pen. See image below for the two tips. 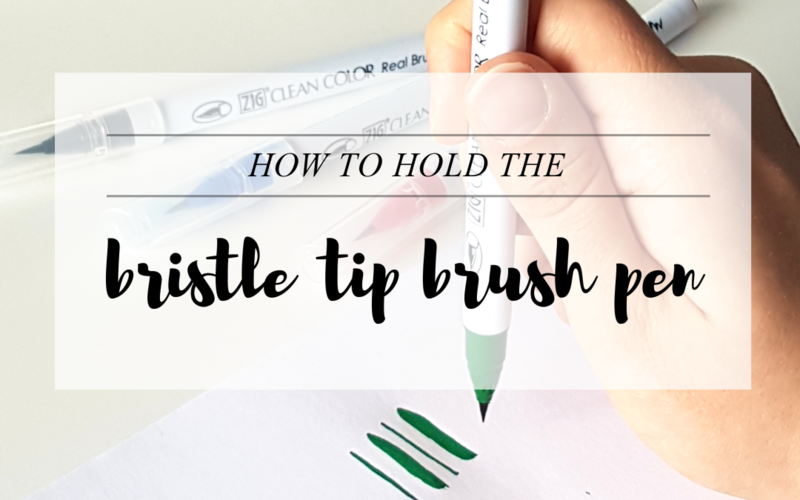 The felt tip pen has to be held at an angle to the paper – see this post – while the bristle tip brush pen can be held in different ways. A great way to get the most use of your bristle brush pen is to hold it at an upright angle. Imagine the end of the pen pointing straight up towards the ceiling. I like to bend at the wrist and have my fingers hold the pen high up, this allows for more control when varying the pressure. But if you’re more comfortable with a grip lower down on the pen and still feel you have enough control, go for it! Because of this hold and the nature of the bristles, you won’t be able to use finger movements to brush letter with these pens. Remember whole arm movements while writing so you have good control and crisp letters. When holding the pen upright it will be important to focus on how to apply pressure to achieve different thickness in your strokes. For thin strokes, allow the tip of the pen to touch the paper and gently move your hand along to make the stroke. Thick strokes require pressure on the pen, at this angle the pressure will come by pushing the pen down on the paper – not all the way down so the bristles point to the sides to much and form streaky lines, but just enough to get a thicker stroke than your thin. How thick the stroke can get depends on the pen and requires some experimenting. If your hand is still and you push down on any bristle brush the little bristle hairs will point in all directions, this can hurt your bristles but it’s also not desirable when you want pretty strokes creating letters. Make sure you’re always moving your hand in a downward motion while applying the pressure! This will take a little practice but trust me, you’ll love the flow and freedom the bristles give. And as always, go slow. Move your hand and arm downwards when your creating a thick stroke with pressure so the bristles down point at all directions. How do you hold your bristle tip brush pen? Do you prefer bristle or felt pens? Let me know in the comments below guys and if you have any questions, just ask away! Subscribe below if you haven’t already to get latest posts and news directly to your inbox and claim your freebies! A video would be great!